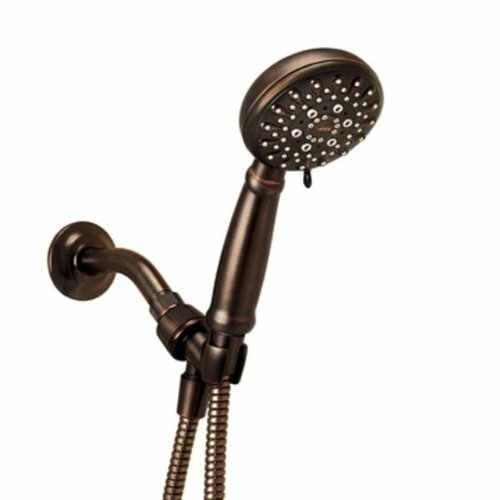 Moen is known for the quality of products they produce and Moen 23015BRN Multi-function Handheld showerhead is not an exception. It offers some uniqueness that can accentuate your bathroom while at the same time giving you good value of performance. In this short review, we are going to expound on the reasons why this product on a good choice for any homeowner who wishes to enjoy every moment in the bathroom. It also features a 60-inch hose that is flexible enough to be used on many other tasks including washing pets. Perhaps this is the strongest feature of Moen products. Their products are outstanding when it comes to design and color. This is very interesting because the showerhead is made of simple materials but the finish affords it a kind of luxury that can only be compared to those expensive, top-of-the range handheld showerheads used in palaces. This simplistic design is elegant and together with the so-called round bell accents, affords the sophisticated/complex values of traditional homeowner. The subtle design is also requires simple installation otherwise it would cancel out the affordability of the showerhead. You do not need any specialized skills to get your new showerhead working. You do not require any specialized tools and materials either. All you need to do is grab the user manual that comes with the package and follow the simple installation instructions. This showerhead features a simple but luxurious design that will accentuate your bathroom. It is very easy to install and the process takes just a few minutes. It is lightweight and comes with a flexile hose to allow flexibility of use. Features innovative design with sophistication that can only mean better showering experiences with upto 5 different spray patterns. It is covered by Moen’s lifetime limited warranty for your own security. Although the showerhead looks elegant, sturdy and sophisticated, it is made from plastic, which may reduce durability. The hose is also made of plastic, which is prone to kinking and therefore interfering with water flow. In case you are looking for a great handheld shower to install to enhance the décor of your bathroom then you can try the Moen 23015BRN Multi-function Handheld. It comes with several great features and specifications that make it a great performer. The showerhead’s design gives it a sophisticated touch while special innovative features ensure great performance.